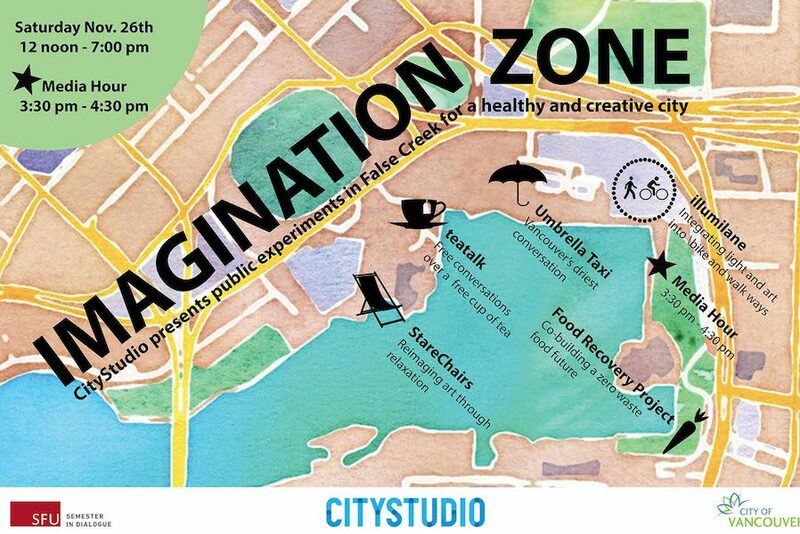 During the Fall 2016 term, participants in SFU’s Semester at CityStudio designed and launched 5 experiments in North East False Creek with a term-long project we called the Imagination Zone. These experiments ask what future behaviours would make our city more engaged, liveable and sustainable? Inspired by the Dublin Studio and DCC Beta, Vancouver’s Imagination Zone is a place of prototypes and experimentation that aims to move the dial on city goals. The projects brings citizens, artists and city staff together for trial and learning – as opposed to trial and error – about how our city works and feels. This project aims to start a conversation with artists and the public, to begin envisioning and prototyping with what could become part of our City in an Imagination Zone. The Imagination Zone project demonstrates that this is a space for trial and learning- as opposed to trial and error. We hope that our pilot projects will invite the participation of citizens in collaborative city building. A traveling mobile tea cart offering rich conversations over free cups of tea. An urban furniture installation that invites community members to sit and participate through interactive mural art on the steps of the Plaza of Nations. An illuminated interactive cyclist and pedestrian path through Creekside Park that integrates art into transportation to promote walking and cycling as safe and fun transportation choices. The Imagination Zone was developed collaboratively with the City of Vancouver’s Public Art Program. Students engaged city staff, artists, urban planning mentors and other local creatives throughout the project development process. “The uniqueness of the CityStudio approach and model allows the City to directly support artists to collaborate.” says George Rahi, Hadden Fieldhouse Resident Artist.